Real Madrid have won the Champions League in 2014. In a final full of pressing, switching play, and cramps, they had the upper hand over an Atlético Madrid side that was fully devoted to fighting for the win. The question before the rojiblancos turned up was whether Diego Costa could play. The 25-year-old started, but only managed ten minutes before being replaced by Adrian. Winger Arda Turan could not make the 18-man squad and Raúl García took his spot in the starting XI. Tiago and Gabi played in front of the defense, while Koke, as an inside left, played halfway between an offensive eight and a left winger. Otherwise, the typical Atlético patterns were there to see in this local derby. The full-backs were situationally wider than the midfield band, which provided control over the center and secured against through balls. In addition, the near winger often moved diagonally during shifts while the far nine dropped wide, so that the Colchoneros stood in a 4-3-3. As the game wore on, the 4-5-1 would be more characteristic for Simeone’s team. It’s difficult to pin a basic strategic orientation on Atletico, but basically they rarely pressed high. They were limited to a deep to high midfield press, wanting Real to push higher up the pitch and leave space behind for them to attack. Real, however, appeared too stable and didn’t allow Atletico many chances on the break. The Meringues mostly played in a 4-4-2, that often became a 4-3-3. While Gareth Bale played linearly as a rather orthodox right winger, Ángel di María usually dropped deeper in the half-space, creating a row of three. Previously, Bale, Cristiano Ronaldo, and Karim Benzema were positioned in a higher line of three, with the Portuguese superstar increasingly moving inwards and opening space for di María. Carlo Ancelotti‘s team was basically focused on constantly switching play and shifting. However, it is hard to find success with this strategy against Atlético The rojiblancos move so consistently and remain compact in the middle of the pitch by indenting their far winger into the midfield line. Therefore, Ancelotti used the forward movements of his two full-backs to produce a 2-5-3. With a five-man middle row, the shifted balls could be played quickly and securely. Breakthroughs would be made ​by Ronaldo and Bale in conjunction with the moving up of the full-backs, Fabio Coentrao and Daniel Carvajal. When the roster was released many expected that Modrić would occupy the central six position and Khedira would use his vertical runs to connect play in the Zehnerraum (ten space). But, the German national played almost exactly the same role as Xabi Alonso. He was a more stable enforcer in front of the defense, protected Modrić, and was always a bit deeper. He and the Croat rarely swapped positions. Khedira situationally moved into the right defensive half-space to be nearer the ball carrier. If the midfield was overwhelmed and he left his position to to prevent the opponent turning, Dani Carvajal supported him. Overall, Khedira’s performance was rather mixed. As a destroyer or a breakwater he was stable, but the 27-year-old looked out of place in the ball circulation. He sometimes blindly kicked the ball about and also indulged in one or two blunders. That Atlético was able to phase Luka Modrić out of the game, was down to the absence of Xabi Alonso. Despite everything, this should not detract from Khedira’s disciplined defensive performance. In addition to the casting of Real’s six position, whether Diego Costa would play or not was also a big question mark. Insert horse joke here. The Spanish national held on for a total of nine minutes before Adrián had to replace him. He and Villa did not provide as much of a threat. Villa’s lack of dynamism, for example, was noticeable in some scenes against Raphaël Varane. Both nines pressed very aggressively against the center-back, who often had to play back to Iker Casillas. However, Atlético would not be Atlético if they didn’t scatter their pressing variants over the course of a game. After half an hour, the two attackers were formed in a more vertical alignment. Sometimes their approach resembled a very compact 4-5-1. Until the opening goal, the Rojiblancos had some problems defensively. For example, in the 24th minute, Villa played a cross into the left offensive half-space that was very predictable. Ronaldo was able to take off. The transition to defense was not played well. Two minutes later, di Maria had a chance on the break. After an Atlético corner he played a one-two with Benzema and was free down the left side. Raul Garcia desperately fouled him. A few moments later, Tiago tried to contribute to the build-up with a pass to the left side. This pass was also transparent. Bale popped up and intercepted the pass only to blow a golden scoring chance. Despite these little errors, the Colchoneros found the opening goal in the 36th minute. A thwarted corner kick was brought back into the box by Atlético. Godin extended over Iker Casillas (who had run out of position) to score. Simeone then called for a permanent switch to a 4-5-1 with a wider diversification of the midfielder band. 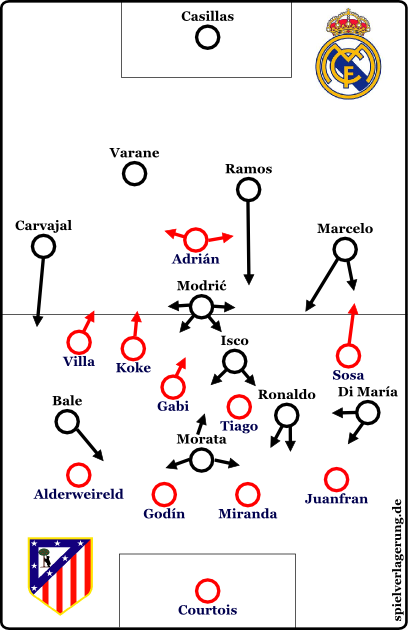 In this form, the Rojiblancos played very effectively against Real’s constant switched balls. They needed less momentum to move side to side and the formation enabled compactness. Although they deployed their pressing deep behind the center line, Real pried the dominance right out of their hands. For a long time the final reflected the two different approaches in offensive structure. 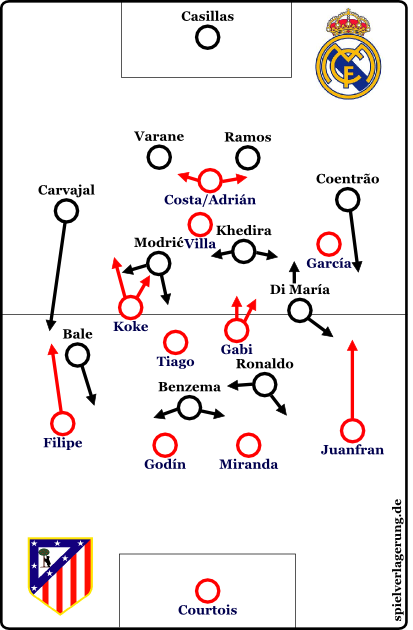 On one side, Atlético was increasingly focused on half-space combinations and diagonal breakthroughs. Real, however, was sometimes so limited on the wing and corresponding shifted balls that the Rojiblancos were able to defend them rather easily. Real lined up often in a 4-3-3. Ángel di María was positioned very deep in the left half-space, which created a wider midfield band. Modrić was on the other side to give vertical thrust and naturally aligned with the deeper game design. Di María, meanwhile, was an important factor in the ball circulation; even compensating for Khedira’s weaknesses. Upon penetrating the offensive third, the Argentine sought to find the chalk on the sideline. Thus, Real Madrid were not too flat; Ronaldo frequently positioned himself in the hole and went after a one touch pass, for example, from Bale or Carvajal, in the position next to Karim Benzema. Atlético on the other hand, doubled up on the wings. Especially on the left wing, which had to do with the very active Carvajal; who was more of a right winger than a right back. In spite of this, the Rojiblancos had no serious problems in ​​defense. On the other hand, they ensured deliberate confusion for their city rivals. The constant changes of rhythm in their pressing, that Simeone either shouted from the sidelines or had already set before the match, led to Real being unable to make their attacks automatic. Again and again they had to cope with new challenges. The Colchoneros gave up the conductor’s baton first as the game wore on in the second half. Ancelotti countered Simeone’s approaches with his own personnel adjustments. He took Khedira off after an hour and brought on the offensive Isco. This brought Modrić into a more central position in front of the defense. Isco was offset slightly higher. Thus, the Spaniard was a suitable combination partner for Modrić. In addition, Isco’s fundamental strengths in tight areas and in the playing of the channels came to fruition. The second change was, at first glance, a true position swap of Marcelo for Fabio Coentrao. However, the Brazilian international is not nearly as linear as his Portuguese colleague. Because of this he moved the offensive storm into the left half-space over and over again at the end, sometimes playing as a second six – and relieved Modrić in the ball distribution. Accordingly, a new pattern was revealed in connection with Di María’s penetrating power. In addition, Marcelo sought to repeatedly dribble or attempt a vertical through ball into Atlético’s channels. 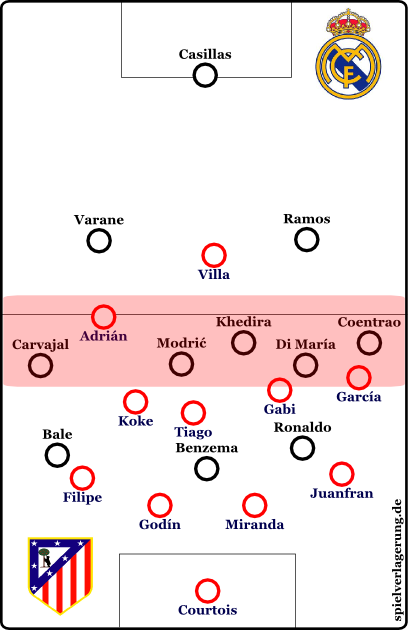 Overall, the Colchoneros had problems with Real’s half-space combinations. They could only inadequately close the gaps in their typical positions, but they remained quite focused and successful in defense around their goal. Simeone’s hands were tied in the closing stages. He could no longer play with a high press. His team took cover in their 4-5-1 and were hoping to survive the last few minutes in their own penalty area. Contrary to my assumption a few days ago, Ancelotti did not switch to yet another striker, but instead brought on Álvaro Morata for Benzema. This helped him make sure he was not short staffing himself in the already narrow space in the offensive center. But, Sergio Ramos moved forward more and worked as a disguised center forward. Bale, meanwhile, despaired on his side. He repeatedly had dangerous chances, but Miranda always knew how to narrow the angle so that the inverted right winger had to make a difficult finish with his left foot. From a tactical point of view, the final stages of regulation time were not really interesting. Real’s pressure was immense. Atlético’s few transition attempts barely managed to pass the center line. In the end it was Sergio Ramos who brought Real into overtime. He headed home a corner kick past Thibaut Courtois in the 93rd minute to score. His man-marker, Godin, was blocked by a teammate, while Ronaldo tried to break the zonal marking in the front area with his run and the zone was outflanked. The intensity in Atlético’s game had noticeably diminished even before the ninety-minutes were up and the Rojiblancos could no longer find their way back into the game. In the first fifteen minutes of extra time they only managed a low double-digit number of completed passes. Real strangled Simeone’s team from then on. Jose Sosa, who as a fresh player still had the necessary strength, miserably missed a few counter opportunities because of his technical weaknesses. The Royals, Isco and Modrić, formed a double-six in extra time. The greatest development of pressure came from Marcelo and Di Maria. With Juan Francisco they had found a suitable victim. The Spaniard was almost in suspended animation. However, in retrospect, by pointlessly playing Diego Costa, Simeone gave away the chance to remove Juanfran. The 2:1 goal for Ancelotti’s team also came from Juanfran’s wing. Di María drove past three opponents. His shot was parried by Courtois, but Bale was able to head it home. Atlético then attacked in a 3-4-3, but the implied risk was understandable. In the 118th minute, the Rojiblancos could no longer attack and Marcelo waltzed right into the penalty area and made it 3-1. Ronaldo put the penalty shot home after a foul by Gabi for the final point; although the not-so-fit Portuguese had previously disappeared as much as possible. This Champions League final will remain a part of the great drama and, on the other hand, the sign of exhaustion for Simeone’s squad. In the end, starting Diego Costa also contributed to the unfavorable situation for the Colchoneros. But that is only one side of the coin. Because on closer inspection, you could see magnificent ideas in terms of Atlético’s rhythm changes and their varied pressing. They also made it also possible to temporarily take Modrić out of the game and push Real to their last nerve with their ever changing approach on defense. The Royals won the game because they arranged their forces better and took advantage of the almost last-ditch effort at the end of regulation time. Ancelotti showed a knack for offensive changes in the second half. In addition, the Italian had the man of the match, Angel di Maria in his team. They can now dedicate a statue in front of the Estadio Santiago Bernabéu to the so often underestimated Argentine. First of all I would like to thank you all. The ones that write these amazing analysis and the ones translating them in english. My website is dedicated to Juventus Torino (myjuventus.net) and every time I get my eyes on a good tactical analysis I translated from italian to english. once again THANK YOU, and keep up the amazing good work!